So for the price of at least $1 if you head to humble bundle, you get great games like Guacamelee which is a metroid-vania type game which I played on my PS Vita and was able to platinum. You get 2 more awesome side scrolling action games in Giana Sisters and Dust, then you also get a puzzler game in The Swapper which has done well and is coming to consoles. 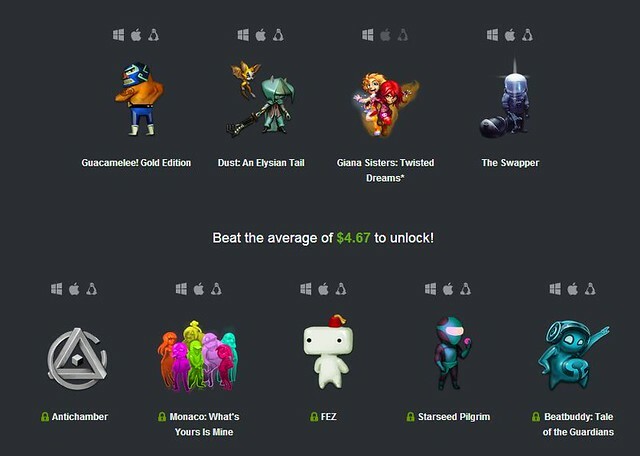 As of writing this, the price to beat is $4.67, and with that you get Antichamber which is a great puzzler and Fez which did very well and loved by a lot of folks. There are also some other games like Monaco, Starseed and Beatbuddy which I am not familiar with. But who cares, it’s part of the package. These deals are good for a few more days, but check out the site, it also has some other deals going on.